You most likely eat at least some genetically modified organisms, or GMOs. Crops that are genetically modified to resist herbicides or produce insecticides came on the market in 1996. According to the Organic Consumers Association, 40 percent of all U.S. crops are GMO, and 80 percent of processed foods contain GMOs. GMO crops are also used as a cheap and fattening feed for factory-farmed animals, which are also often injected with genetically engineered hormones. The USDA reports that 88 percent of corn and 93 percent of soybeans are GMOs, as are 90 percent of cotton and canola. GMO corn is engineered to produce its own insecticide called Bt toxin. Some newer varieties are also resistant to weed killers or herbicides. 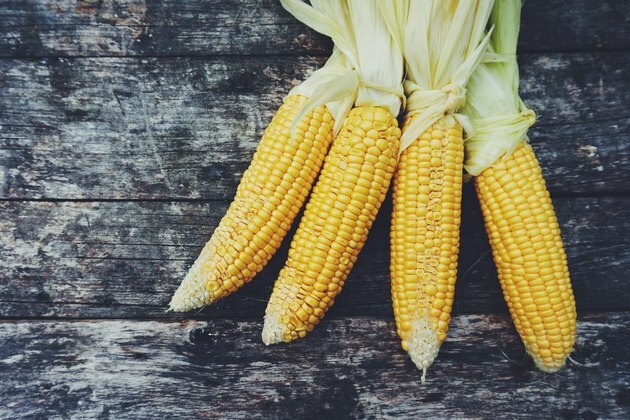 Avoiding GMO corn can be challenging because so many food products are derived from it or contain it. Obvious sources are sweet corn, corn muffins, corn chips, corn flakes, tortillas and popcorn. Less apparent sources may be hidden in the ingredient list, such as high fructose corn syrup, regular corn syrup, corn oil, corn starch, corn flour, dextrose, glucose and sugar alcohols such as xylitol. Most vitamin C supplements are synthesized from GMO corn. GMO soy is engineered to resist being sprayed with weed killers. Popular soy foods are soy milk, tofu, soy chips, edamame, miso, soy sauce, baby formula, protein drinks, energy bars, bread made with soy flour and meat substitutes such as soy "turkey." Soybean oil is an ingredient in mayonnaise, salad dressings, prepared foods, canned tuna and supplements such as vitamin E.
Partially hydrogenated soybean oil, a major source of trans fat, is used in baked goods and fried foods. Soy can be disguised as textured vegetable protein, hydrolyzed vegetable protein, vegetable broth and natural flavoring, so reading labels is essential. Cottonseed oil, found in many processed foods and canned nuts, is mostly GMO. Canola oil, an ingredient in many so-called “healthy” foods, is also mostly GMO. Canola mayonnaise and salad dressings, therefore, are usually GMO, just like their soybean oil counterparts. Most commercial sucrose, or table sugar, is made from GMO sugar beets instead of sugar cane. Hawaiian papaya and some varieties of zucchini and yellow squash are GMO. Many dairy foods, unless specified otherwise on the label, contain traces of recombinant growth hormone (RBGH), administered to cows to increase milk production. Meat products that are not certified organic or grass-fed have been raised on GMO corn and soy. The best way to avoid GMOs is to cook at home using certified organic ingredients. Organic foods, by law, are non-GMO. When buying produce such as corn, look for the PLU code on the label — if it begins with 9, it is organic. If you use packaged or prepared foods, look for “USDA Certified Organic” on the label. Packaged foods that contain at least 70 percent organic ingredients are not permitted to contain GMOs. Assume that all restaurants are serving GMOs. The vast majority of non-organic products sold in a conventional supermarket, including pet foods and baby foods, contain some form of GMO corn, soy or other ingredients. Non-GMO Project: What is GMO?